I write this blog in order to expand upon the ideas presented in my book Chess Structures – a Grandmaster Guide, published this year by Quality Chess. I follow the games of the elite on a daily basis, often looking for new instructive examples and structure-related concepts worth sharing with my readers. After a very long absence from this website (school work and new writing projects), I have decided to get back into blogging. As some of you may have noticed, I started publishing my blog within chess.com (publishing chess boards with them is so much easier). This post was published in my chess.com blog about 8 months ago, but I never got around to posting it here. For those of you who haven’t seen it, here it is. For those of you who have, I will be posting my 9th post tomorrow, and new content on Friday. I will also take that opportunity to give some updates. Over the past few days, the 68th Russian Superfinal took place in the city of Chita. Evgeny Tomashevsky took clear first, once again proving he is a new Russian super star to watch. Being that said, I was very interested in following the games of the young star Vladislav Artemiev, in his quest to reach 2700 rating. The young player Vladislav Artemiev has been a topic of conversation for both specialists and amateurs who enjoy following the progress of the most promising prodigies in the world. He is currently rated 2671, at the age of 17, he is the second most important junior player after the Chinese super star Wei Yi, who is currenty ranked #23 in the world, despite being only 16. I found this game interesting because it is a great example of Black’s …g6-g5 idea against the Hedgehog structure (which I cover in Chapter 10). 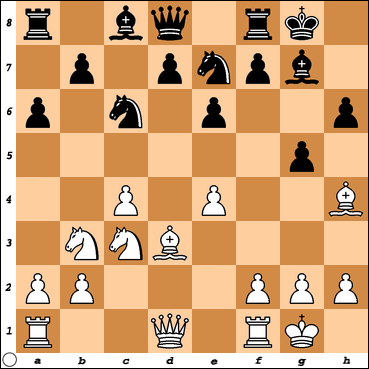 Artemiev’s idea seems rather risky at first, but the game’s analysis prove its solid positional foundation. I also Artemiev’s fighting spirit should be commended. He plays for a win with Black, from the very first move, against a much higher rated player. 1. e4 c5 2. Nf3 e6 3. d4 cxd4 4. Nxd4 a6 5. Bd3 Ne7!? 6. O-O Nbc6 7. Nb3 g6 8. c4 Bg7 9. Nc3 O-O 10. Bg5 h6 11.Bh4 g5! I really like this move regardless of what the computer may think. 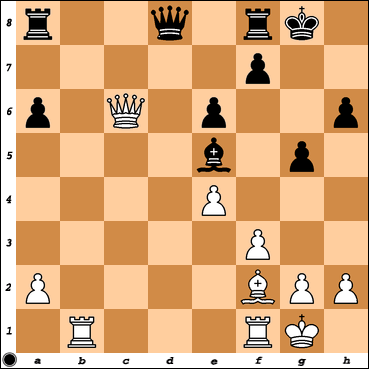 It is difficult to play for a win with Black, and it is often necessary to take risks. This is exactly what this move is doing. Black is now announcing his intention to fight for the control of dark-squares, by preventing White from playing the desirable expanding move f2-f4 at some point. Another option was sacrificing a pawn with 17… b5! 18. cxb5 axb5 19. Bxb5 Bc6! 20. Bxc6 dxc6 21. Qxd8 Rfxd8 where Black has more than enough compensation. With three minor pieces off the board, and a near symmetrical pawn structure, one wouldn’t expect Black to dominate the game so clearly. Typically one would say that Black’s pawns on e6-f7-g-h6 are weak, while White’s pawns on e4-f3-g2-h2 are strong, but here it is exactly the opposite. 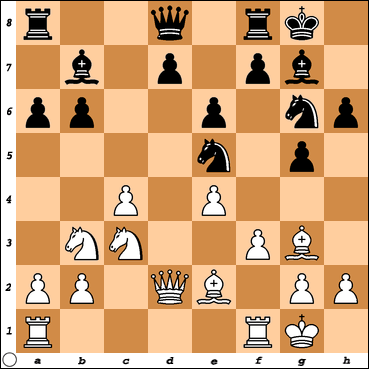 There are no real targets in Black’s kingside, while the diagonal h2-b8 is a serious concern for White. 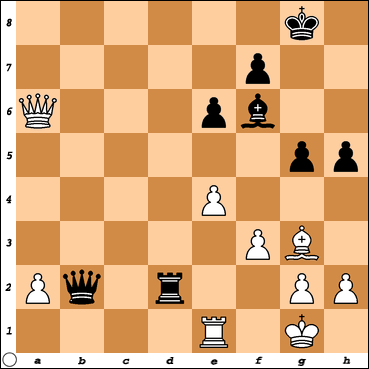 The key idea in this game was Black’s …h7-h6 followed by …g6-g5. This is a relatively standard approach against the Hedgehog structure, in order to fight for the dark-squares. After move 12th, Black might seem to be somewhat behind in development, but this didn’t make a difference because Artemiev had taken positional control of the game. 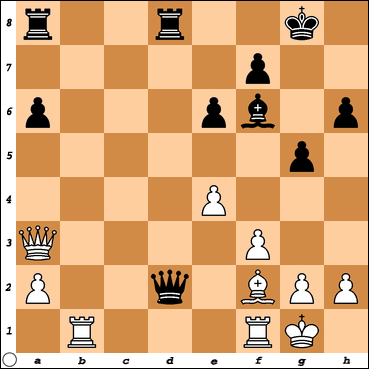 White spent the next few moves simply moving around in a futile search for a plan. The position after move 25th is a great illustration of Black’s strategy. Even though the position is simplified and his kingside might seem to be weakened, he continues to be in control of the game. His position is far more threatening, and his king safer than White’s. Artemiev is one of the world’s young starts to watch. As usual, comments and suggestions are always welcome. If you like this content, do not forget to follow this blog by clicking the “Follow” option at the right bottom of the page.